Fayette County Jail - Volz & Associates Inc. 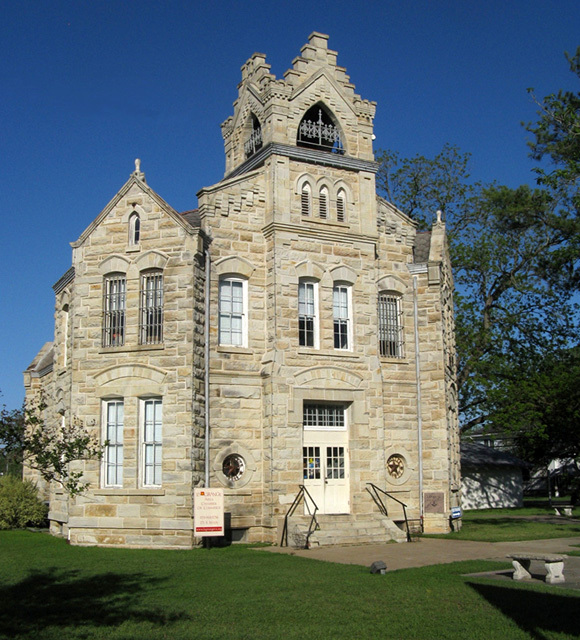 The Fayette County Jail is one of few surviving 18th century Texas jail structures and possesses a level of architectural detailing that was uncommon for buildings of this type. Designed by the short-lived partnership of Austin architects John Andrewarthe & James Wahrenberger in 1881, the building was officially completed in 1883. The jail is designed in a Victorian Gothic style, with exterior walls built from rusticated sandstone quarried from Buckner's Creek north of Muldoon. The two-story jailer's quarters occupies the front (west) portion of the site, while the large one-story cell block portion extends to the east. The central mass of the jailer's quarters is topped with a stepped parapeted tower with decorative cast iron railings infilling the arched openings on each side. Fayette County hired us to complete an exterior condition assessment and opinion of probable costs for exterior repairs and roof replacement. The composition shingle roof was subsequently replaced with slate shingles to match the original design and configuration. Our findings were presented to the Commissioner's Court and public during a community hearing. • Wood windows and doors require repair and weatherization.